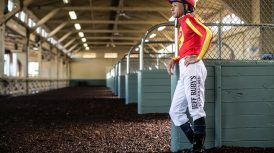 ARCADIA, Calif. (Jan. 18, 2019)–Jerry Hollendorfer’s Vasilika, Jeff Mullins’ Amandine and Neil Drysdale’s La Sardane head a field of seven older fillies and mares going a flat mile on turf in Sunday’s Grade III, $100,000 Megahertz Stakes at Santa Anita. The Megahertz, which has been carded as the eighth on a 10-race card, will highlight a Martin Luther King, Jr. Day Holiday program that also features one dollar beers and sodas, as well as two dollar hot dogs. 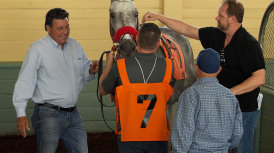 Vasilika, who was claimed by Hollendorfer for $40,000 ten starts back on Feb. 11, 2018, had an eight-race win streak broken when she finished fourth, beaten two lengths as the 2-1 favorite in the Grade I Matriarch Stakes at Del Mar Dec. 2. English-bred Amandine, who was an impressive 2 ¼ length winner of the ungraded Lady of Shamrock Stakes here Dec. 26, wheeled back three days later in the Grade I American Oaks and was a respectable third. La Sardane enters the Megahertz as a fresh commodity, as she’s been idle since well beaten in the Grade II Goldikova Stakes here on Nov. 4. 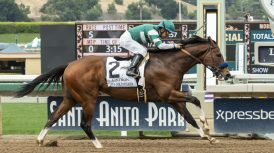 A Grade III winner going seven furlongs on turf in New York four starts back on June 7, she looms dangerous for Drysdale, who finished 2018 with an 18 percent strike rate. One of the best claims in recent memory, this 5-year-old Skipshot mare won nine of her 11 starts last year and banked $632,328. 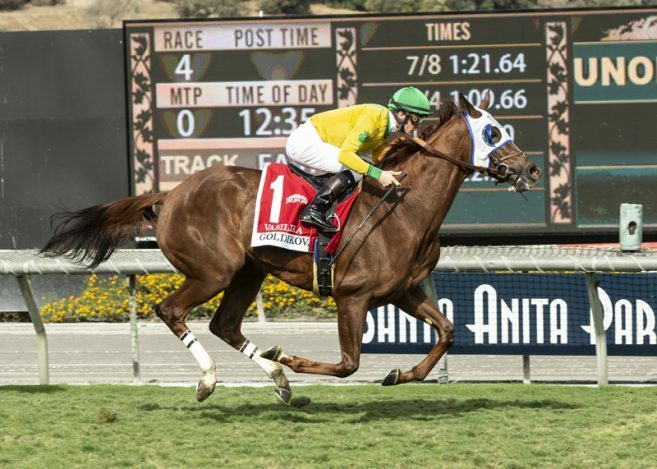 A winner of seven out of her eight races over the Santa Anita turf, Vasilika has proven she’s versatile enough to lay close or rally from off the pace. With Flavien Prat riding back for the 10th consecutive time, she’s strictly the horse to beat as she tries to improve upon an overall mark of 28-13-4-3 and earnings of $758,595. A winner of her U.S. debut at one mile on turf three starts back on Nov. 22, she replicated that effort in taking the one mile grass Lady of Shamrock on opening day and based upon the ease with which she won, was entered to run back in just three days in the Grade I American Oaks Dec. 29. A respectable third, beaten 2 ¾ lengths, she comes back at a distance she’s well accustomed to, having two wins and as many seconds from five starts at a mile on grass. 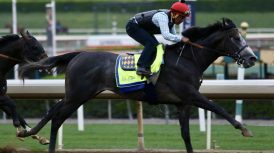 Ridden by Mike Smith in the American Oaks, she’ll be reunited with Drayden Van Dyke, who was aboard for her first two Southern California starts. A winner of three out of her first four starts for Drysdale, this 5-year-old French-bred mare was also a Group II winner at a mile on grass in France at age three. 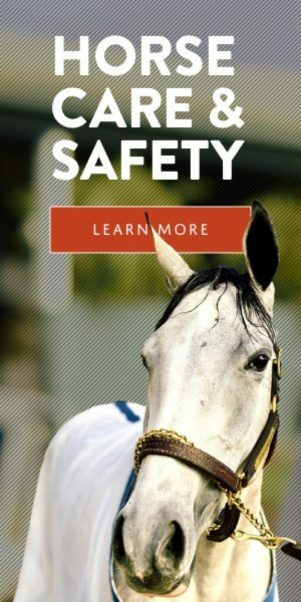 Ridden by Flavien Prat in her three wins; at Churchill Downs, May 3, Belmont Park, June 7 and also at Belmont on June 30, La Sardane will be handled for the first time on Monday by Joel Rosario. With two wins and a third place finish from eight tries at one on turf, she’s 13-5-3-1 overall and rates a huge chance in the Megahertz. 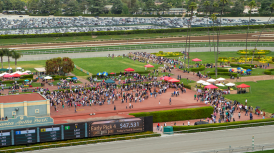 Special early first post time for a 10-race card on Monday is at 12 noon. 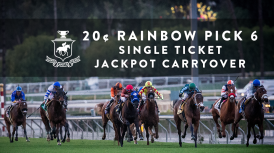 For additional information, please visit santaanita.com or call (626) 574-RACE.